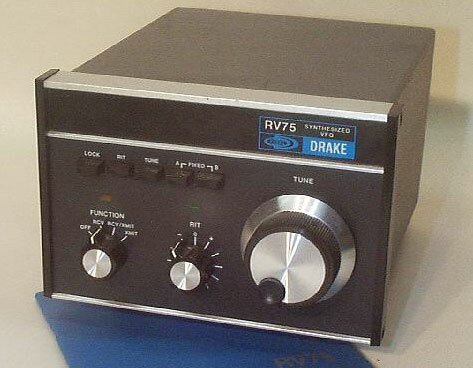 Drake receiver 1A. 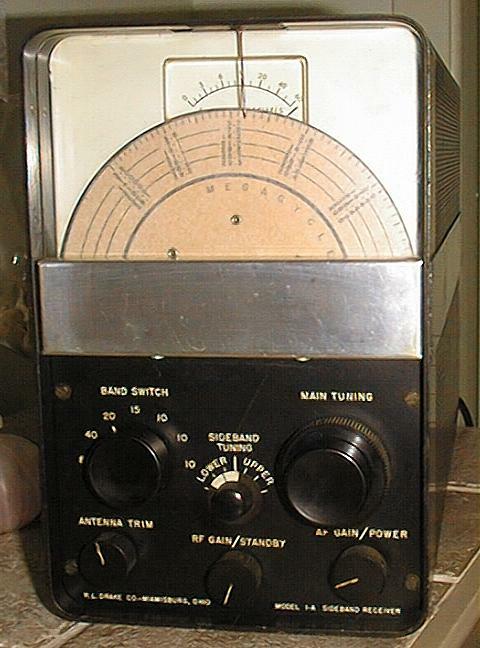 The Drake 1-A receiver was the first commercially built amateur receiver designed for single sideband reception. Radical for its time; in 1957, it represented a departure from the trend of "big and heavy" design and focused on performance and functionality. The receiver is set up to receive only SSB and CW. There is no AM detector. 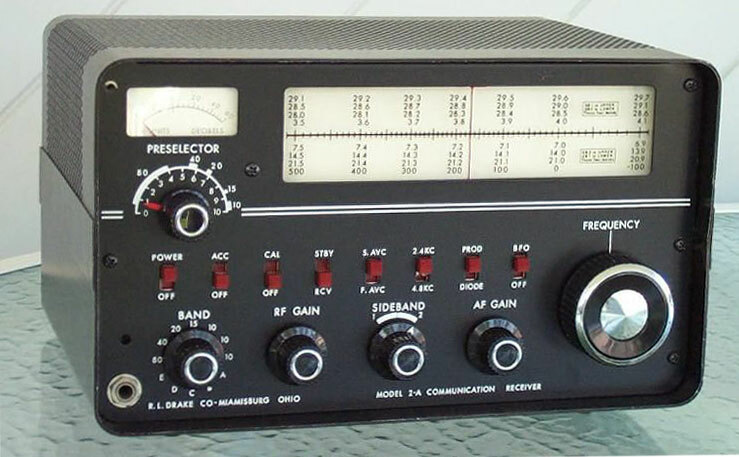 The twelve tube receiver has a crystal-mixed front end on the 80-10m ham bands. There is a rear-firing Jensen speaker factory installed on the rear panel. Selectivity is 2.5 KHz at 6 db down and 8.1 KHz at 60 db down by use of an L/C filter. A smooth two speed dial is employed and the famous Drake passband tuning is a joy to use. Drake receiver 2A. 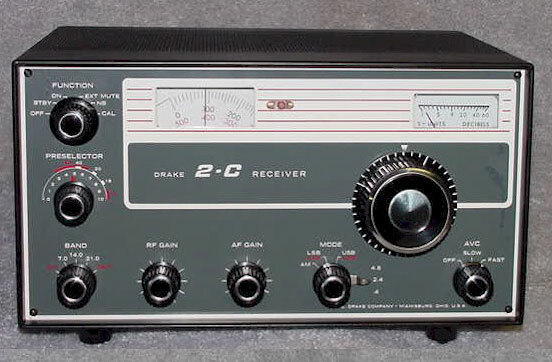 The Drake 2A receives AM, USB, LSB (SSB) and CW signals. It is set up for the ham bands but could easily be crystaled up for the shortwave bands as well. The unit can be crystaled up to support any of WARC bands or expanded 10 meter coverage in 500 khz increments. This rig was affectionately known as 'The Poor Man's Collins' and/or 'Black Box'. Measurements of the unit are 12" wide x 7" high x 9" deep. 80 meters (3.5 - 4.1 mc), 40 meters (6 9 - 7.5 mc), 20 meters (13.9 - 14.5 mc), 15 meters (20.9 - 21.5 mc), 10 meters (28.5 - 29.1 mc). SELECTIVITY: .5 kc at 6 db down, 2.75 kc at 60 db down; 2.1 kc at 6 db down, 7.5 kc at 60 db down; ‘3.6 at 6 db down, 10.5 kc at 60 db down. Selectivity switching is independent of detector switching. SPURIOUS RESPONSES: Image rejection more than 60 db; IF rejection more than 60 db on ham ranges; Interna1 spurious signals within ham bands less than that from a 1 micro volt antenna signal. FREQUENCY STABILITY: Less than 400 cycles warm up; less than 100 cycles after warm up; less than 100 cycles for 10% line voltage change. DIAL CALIBRATION: 10 kc main dial division; approximately 1 kc Vernier dial divisions; Both main dial and Vernier adjustable for calibration purposes. SENSITIVITY: Less than 1/2 micro volt for 10 db signal to noise. AVC: Amplified, delayed AVC having .75 sec or .025 sec discharge; less than 100 microsecond charge. AUDIO OUTPUT: One watt maximum, .2 watt at AVC threshold . AUDIO DISTORTION: Less than 3% harmonic, , less than 1/2 % inter modulation. TUBES : 6BZ6 RF Amplifier; 6U8 crystal controlled 1st mixer; 6BE6 VF0 controlled 2nd converter; 6BE6 fixed frequency 3rd converter; 6BA6 50 kc IF amplifier; 6BE6 Product Detector and BFO; 8BN8 1st audio amplifier, bias rectifier and AM noise limiter; 6AQ5 audio output; 6BF6 AVC Amplifier-Diode detector-and AVC rectifier; 6X4 Rectifier. POWER CONSUMPTION: 40 watts, 120 volts 60 cycle AC. DIMENSIONS : 12" wide X 7" high X 9" deep. WEIGHT : 14.5 pounds. 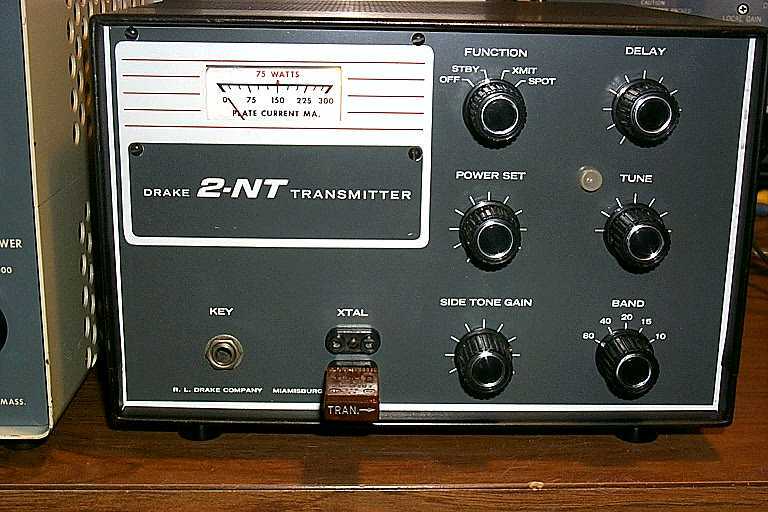 Drake 2-NT CW Transmitter. 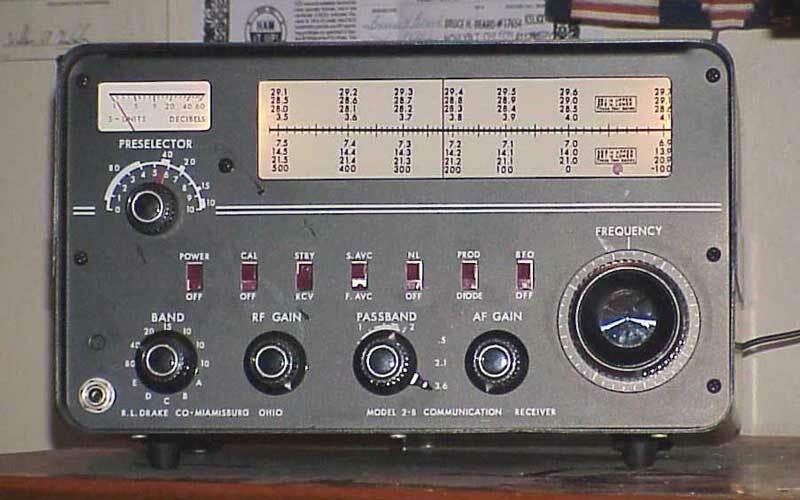 3-tube (+ semiconductors) with 6EA8, 12BY7 and 6HF5 PA. Coverage includes the CW portions of the 80,40,20,15 and 10 meter bands and frequency is controlled by a crystal or external VFO. Input variable to 100 watts with a "redline" at 75 watts for novice operation. Internal 117 VAC power supply.